I'm running a little late this morning, because I'm getting ready to go out of town. On Tuesday, I'm heading to Providence, Rhode Island, for four days of training in Zentangle. When I'm done, I'll be certified to teach this artform. I have to admit, I never thought that my boss, Dodie Goldfader, would spring to pay for something like this. When she asked me if I'd like to get certified to teach Zentangle®, I squealed like a ten-year-old. See, it's not that I don't love scrapbooking. I do. But Zentangle is infinitely more portable. Plus there's evidence that it somehow helps put your into a mental state where pain messages get blocked and you experience deep relaxation. Who couldn't use a portable, cheap, accessible vacation now and again? It's an artform created by Rick Roberts and Maria Thomas. Using a series of repeated strokes, a person can shift from left brain thinking to the right brain, resulting in a meditative state. You become centered, sane, and in the moment. You start with a defined area, often with a pre-cut tile that's roughly 3 1/2" x 3 1/2". Then you subdivide the tile into section. (In the elephant above, the pre-defined area was the outline of the elephant. The sections are the portions of his trunk, the saddle-shaped area, his tail, portions of his legs, and parts of his torso. You can see where the portions began and ended because the patterns changes. "Tangles" or patterns are used to fill in the sections. And the patterns typically have names such as Hollibaugh, Cadent, Zin, and Chard. It's up to the individual to selection which pattern to put where. In the tangle above, I used a person's initials as the "strings." If you look closely you can make out D - S - S.
The best part about Zentangle for me is that you can do it almost anywhere and anytime. I keep a tile and pens in my purse. After all, if there's anyone who needs to be centered, sane, and in the moment, it's a single mom of a pre-teen. I guess that's what Dodie thinks, too. "Sunshine, I'm not just sending you because I want you to come back certified so you can teach. I'm sending you there because it's cheaper than sending you off to Tibet to learn to meditate. It'll probably be faster than waiting for you to learn to meditate, too!" And Dodie smirked. Hmm. Those smirk lines remind me of a pattern... I'm off to grab my pen! 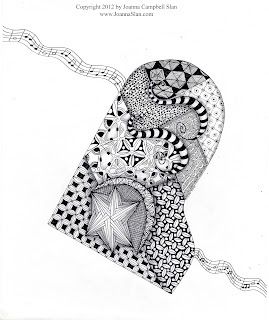 PS Want to read more about Zentangle? Go to their website. You can also see other examples of Zentangle designs in each of the covers of my new Kiki Lowenstein Short Stories. The most recent is "Kiki Lowenstein and the Empty Heart." Amazingly creative and wonderful, Joanna! I mustering the courage to try one. 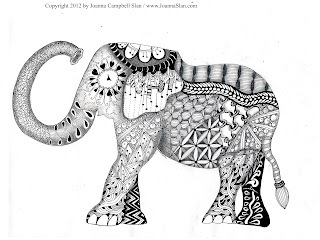 Pardon the typo -- what hope do I have for a Zentangle? Looks very interesting and very creative. Had not heard of Zentangle until now. Have added your books to my wish list. I love mysteries and cozy. Camille, you can do this. It's very simple. You just make one stroke after another! Miss Kallie, visit the Zentangle website. You'll be amazed!